One day a few months ago, I was thinking to myself, "Self, you need to get your work seen by more people. What can you do to make that happen?" I thought maybe entering some photo contests and answering a few of the calls for submissions would be a step in the right direction. 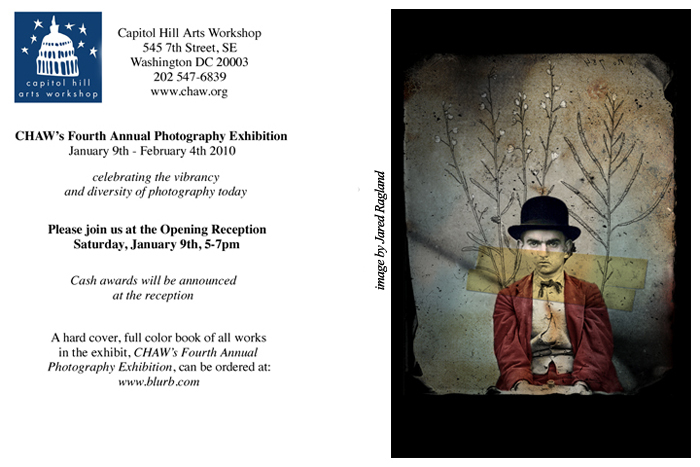 Well I did just that and my work was accepted for the Capitol Hill Arts Workshop's 4th Annual Photography Exhibition. Now hopefully I can tap into the billion dollar industry that is high school sports photography. Anyway, you should come out to 545 7th St. SE this Saturday January 9th from 5p-7p for the opening reception. Not only to see my work, but all the other great work hanging at the Capitol Hill Arts Workshop.